Yesterday morning as I opened up my twitter feed to see what latest wacky method someone had employed for their Ice Bucket challenge, I soon found myself reading through another twitter discussion between Northern Ireland’s two greatest parody twitter accounts, LAD and Jamie Bryson. Only one of which is actually a genuine parody account believe it or not. For those who don’t know and who maybe don’t even care let me explain briefly who LAD and Jamie are. 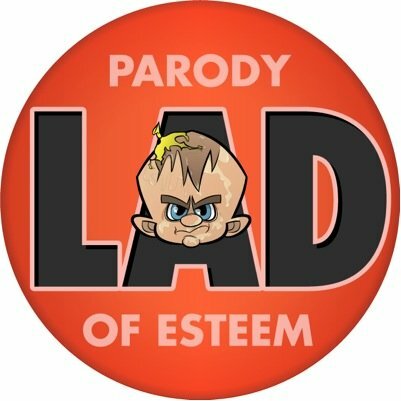 LAD are a satirical twitter account, who under the guise of a quintessential Loyalist seek to highlight the absurdities of those cultures in Northern Ireland (both Unionism and Republicanism) which from the outside must look like parodies in themselves. The obsession with flegs and culture and parades. They bring to light the contradictions that many in the political world of Northern Ireland seem to have no problem in portraying. Using twitter as their main tool as well as occasional parody videos (where they are strongest), they for the most part are successful, while being hilarious. Think, a sort of Stephen Colbert type character, that is employing the beliefs they obviously don’t agree with in order to highlight their absurdities. But with bad grammar (intentional) and an ironic love of flegs. They are not however perfect. More on that later. In the other corner we have Jamie Bryson. A young (at least I assume he is, his baby faced features make it truly difficult to tell), proud, Loyalist who was seen as a spokesperson of sorts for the fleg protests of November 2012, after Belfast City Council voted to fly the Union Flag on a select designated number of days, rather than the entire year. And yes, this did warrant country wide street protests and violence. Want to fight about it? Jamie is passionate, of that no one can deny (is this a lyric?) but his own contradictions are his downfall. Like continually lambasting LAD for their “hateful” and “vile” attacks on those in his culture, while being caught on camera in a crowd of people throwing missiles at another community. D’oh! But they both have something in common which may just be the last thread of hope for reconciliation between the two. They both have an identity crisis. With LAD, I’m never quite sure of who they are supposed to be. While they make a very good go at using humor to view the political situation in Northern Ireland, they often find themselves being sucked into petty twitter disputes with the likes of Jamie Bryson. They break out of character, which weakens the power that their satire has, as rusty and as rough around the edges as may be sometimes. Compare this to earlier in the year when someone from the aforementioned Stephen Colbert show, tweeted from his characters account something which was deemed racist. It wasn’t. It was a use of satire to highlight the ignorance of racism. He wasn’t really being racist. Rather than personally taking to twitter or social media to get angry or annoyed, he and his writers took a breath, stayed in character and delivered this amazing response on the next edition of the show. This is what LAD need to perfect if they are to truly shake up the political landscape of Northern Ireland. They need to understand that Jamie is someone who has a limited voice in politics and since many of his ideas would have been embarrassing at the height of the troubles, they should seek to make fun of them without getting personal. This only gives Jamie more ammunition and also distracts LAD from what they do best. Making fun of those who have outdated and harmful views on how Northern Ireland should be run. Lately, Jamie has threatened to expose the real faces behind the LAD account. He says he knows, and he may well do. But LAD should put an end to this and expose themselves (simply their identity that is, nothing illegal). This would take the one trick Jamie could possibly have up his sleeve and would give LAD the chance to concentrate on doing what Northern Ireland politics is crying out for them to do. Jamie’s identity crisis is just a little more sinister. This is only important because the Gospel that Jamie believes in is far removed from the life that Jesus led where He challenged His own tradition and most pertinently for Jamie, one that is unrecognizable from the call to love His enemies. Until Jamie, sorts this muddled view of His faith then His identity will always be confused. For Jamie, this will diminish his great passion that he could direct at building a Northern Ireland where we make the next leap from peace to one where we trust those on the other side. Perhaps even, to a time when there is no other side. But for now, as Jamie threatens and promises to finally expose the faces behind LAD, maybe there is one possible explanation for why he keeps stalling. One that no one would see coming. What if Jamie Bryson is LAD?! How do you know when you’re right about God?